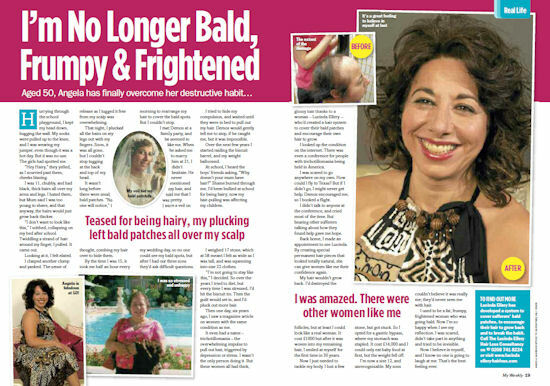 After a lifetime of hair pulling Angela has bald patches and was seriously overweight. Now, with help from Lucinda, she’s turned her life around. Hurrying through the school playground, I kept my head down, hugging the wall. My socks were pulled up to the knee, and I was wearing my jumper, even though it was a hot day. But it was no use. The girls had spotted me. “Hey Hairy,” they yelled, as I scurried past them, cheeks blazing. I was 11, chubby, and had black, thick hairs all over my arms and legs. I hated them, but Mum said I was too young to shave, and that anyway, the hairs would just grow back thicker. “I don’t want to look like this,” I sobbed, collapsing on my bed after school. Twiddling a strand of hair around my finger, I pulled. It came out. Looking at it, I felt elated. I clasped another clump and yanked. The sense of release as I tugged it free from my scalp was overwhelming. That night, I plucked all the hairs on my legs out with my fingers. Soon, it was all gone, but I couldn’t stop tugging at the back and top of my head. It wasn’t long before there were small bald patches. “No one will notice,” I thought, combing my hair over to hide them. By the time I was 15, it took me half an hour every morning to rearrange my hair to cover the bald spots. But I couldn’t stop. I met Demos at a family party, and he seemed to like me. When he asked me to marry him at 21, I didn’t hesitate. He never mentioned my hair, and told me that I was pretty. I wore a veil on my wedding day, so no one could see my bald spots, but after I had our three sons they’d ask difficult questions. I tried to hide my compulsion, and waited until they were in bed to pull out my hair. Demos would gently tell me to stop, if he caught me, but it was impossible. Over the next few years I started raiding the biscuit barrel, and my weight ballooned. At school, I heard the boys’ friends asking, “Why doesn’t your mum have hair?” Shame burned through me. I’d been bullied at school for being hairy; now my hair-pulling was affecting my children. I weighed 17 stone, which at 5ft meant I felt as wide as I was tall, and was squeezing into size 22 clothes. “I’m not going to stay like this,” I decided. So over the years I tried to diet, but every time I was stressed, I’d hit the biscuit tin. Then the guilt would set in, and I’d pluck out more hair. Then one day, six years ago, I saw a magazine article on women with the same condition as me. It even had a name – trichotillomania – the overwhelming impulse to pull out hair, triggered by depression or stress. I wasn’t the only person doing it. But these women all had thick, glossy hair thanks to a woman – Lucinda Ellery – who’d created a hair system to cover their bald patches and encourage their own hair to grow. I looked up the condition on the internet. There was even a conference for people with trichotillomania being held in America. I was scared to go anywhere on my own. How could I fly to Texas? But if I didn’t go, I might never get help. Demos encouraged me, so I booked a flight. I didn’t talk to anyone at the conference, and cried most of the time. But hearing other sufferers talking about how they found help gave me hope. Back home, I made an appointment to see Lucinda. By creating special permanent hair pieces that looked totally natural, she can give women like me their confidence again. My hair wouldn’t grow back. I’d destroyed the follicles, but at least I could look like a real woman. It cost £1000 but after it was woven into my remaining hair, I smiled at myself for the first time in 30 years. Now I just needed to tackle my body. I lost a few stone, but got stuck. So I opted for a gastric bypass, where my stomach was stapled. It cost £14,000 and I could only eat baby food at first, but the weight fell off. I’m now a size 12, and unrecognisable. My sons couldn’t believe it was really me; they’d never seen me with hair. I used to be a fat, frumpy, frightened woman who was going bald. Now I’m so happy when I see my reflection. I was scared, didn’t take part in anything and tried to be invisible. Now I believe in myself, and I know no one is going to laugh at me. That’s the best feeling ever.